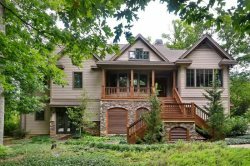 A New England Style Queen Anne Shingle House meets mountain/lake in this captivating home set on a large private corner waterfront lot at the Cliffs at Keowee Vineyards. Built by Gabriel Builders, the big lake and long-range mountain views are put to full advantage in the design of this 5,160 square foot home with four bedrooms, each with en suite private bath. A separate apartment offers a fifth bedroom and full bath above the three-bay garage. Outdoor living spaces are expansive, varied and take full advantage of the more than 1250 square feet of porches fronting 229 feet of waterfront. Multiple options for Alfresco or screened in dining adjoins large sitting areas complete with wall sconces, ceiling fans, central music and a dry stacked natural wood burning stone fireplace with rough cut wood mantels overlooking the lake. Relax next to the Koi pond above the lake or entertain in front of the fire pit near the covered two boat slip. An abundance of French doors provide ample access to porches on three sides of the house, and to the lush landscaping beyond. Within, the Colonial style keeping room is captivating, with its wood-lined, barn vaulted ceiling, exposed beams, heart-of-pine flooring, stone fireplace and archway to the kitchen. This open room houses both sitting and dining areas, and is flooded with light from its six Gabled Fronted Dormers and three French doors. The stunning wood chandelier and the gas fixtures to either side of the fireplace completes the entertainment center of the house. A well-equipped kitchen with granite surfaces, high-end appliances, custom cabinetry with separate beverage bay, a wood-paneled office, a sumptuous master suite with fireplace, wet bar and a large media room are further highlights in this exceptional home. Much admired, both from the lake and from the land, this beautiful property offers a perfect sunset view and an enviable situation and lifestyle.